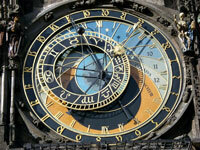 Prague's medieval astronomical clock, also known as the Prague Orloj, is mounted on the southern wall of the Old Town City Hall, and is popular with tourists eager to watch the clock's show every hour. It comprises three main components, namely the astronomical dial, which represents the position of the sun and the moon in the sky, 'The Walk of the Apostles' showing moving sculptures, and a calendar dial with medallions representing the 12 months. The show begins with Death, represented by a skeleton, pulling the bell cord with one hand while holding a Clessidra (hourglass) in the other. The Apostles then come out of the windows in a procession and return back inside. Once the windows close, a cockerel flaps and crows in an alcove followed by the chimes of the hour. The parody is accompanied by the Turk shaking his head, the Miser watching his bag and Vanity admiring himself in a mirror, and makes a wonderful spectacle for visitors to Prague. All in all, the hourly show lasts about three minutes. Otherwise, visitors can climb the tower and see the clock mechanisms from the interior. They can also enjoy great views of the Old Town Square from the top.